Early in 1909, not one, but two different railroad companies raced to lay tracks into the booming town of Courtland. The Southern Pacific Railroad, acting through its subsidiary, the Arizona and Colorado Railroad (A&C RR) committed 1000 men and more than 300 teams of animals to building a line south from Pearce to Douglas. 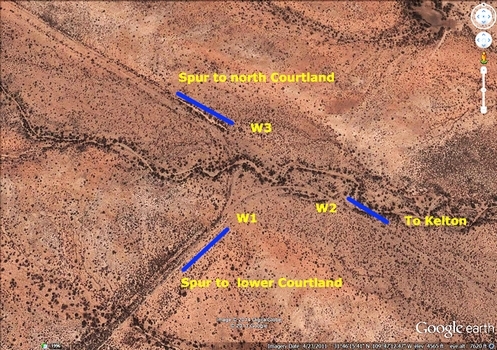 Along the way, a spur line was split off to the west toward Courtland and Gleeson. Meanwhile, the El Paso & Southwestern Railroad had its own subsidiary, the Mexico & Colorado Railroad (M&C RR) working toward Courtland from the town of Douglas. The EP&SW employed a much smaller work force than the SP. The tracks of the two companies crossed one another east of Courtland at Kelton. for the final jaunt into town. North of the Kelton crossing, the EP&SW split their Courtland line into two spurs. Direct access into the town was not an issue for this company. Right of ways had been secured and the road beds were constructed to the ore bins of each of the major mines of the area. The southern spur entered the Great Western townsite portion of Courtland at its lower end. It then turned northward along Main Street and ran to mines in the central part of town. The two story Courtland Station was established inside the turning wye as the track entered the town. The northern spur ran between central Courtland and the upper townsite to mines to the northwest. The EP&SW had a monopoly on the ore transport. The ore from the Courtland mines was not taken to the smelter at Douglas as originally planned, however, but was shipped through Douglas on to El Paso. 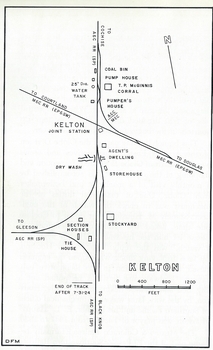 Late in 1909, with the death of SP's chairman, the construction of the final part of the SP line south from Kelton was stopped just short of Douglas. It never resumed. 23 miles of track were installed but never used. The boom days of Courtland did not last very long. As early as 1910, mines were in the process of closing. There was not as much ore as originally thought. The railroads had to cut their services dramatically. Where there had once been daily runs, trains ran only a few times each week. In subsequent years, there were a few pulses in production, but by 1921, Courtland was essentially empty. In 1924 EP&SW sold out to the Southern Pacific. Small shipments of livestock and acid from the Douglas smelter kept the Douglas to Cochise line going for a few more years. 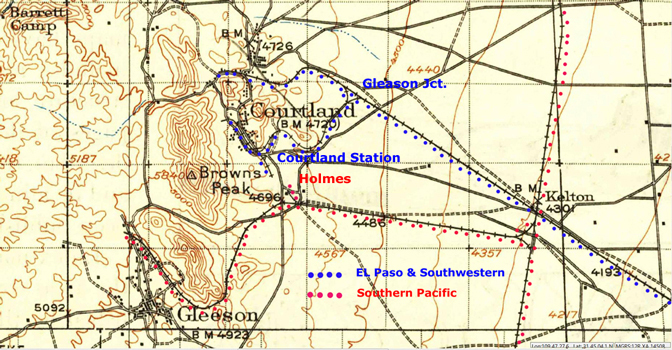 All of the lines south of Cochise were taken out of service in July of 1933. By the end of the year the rails had been taken up. To see what may remain of the old railroads, I walked the southern spur of the EP&SW line from the Courtland Road out to the wye track east of town. That was followed up by a drive and several walks along parts of the northern spur line into upper Courtland. My last trip to the area involved driving on the old SP spur for several miles. I walked the final two miles or so on to the old Kelton wye. The photos pretty much show what exists of the old lines today. The Google Earth view above is of the southern spur of the EP&SW railroad from the wye track at Gleason Junction southwest to the modern Courtland Road. After more than 100 years the old roadbed is still very visible. The distance out to the wye section of track was approximately 3 miles from the Courtland Road crossing. The dark material in the old roadbed near the Courtland Road crossing is primarily coal. I do not know why it is here. It was not unusual for coal to fall off the old trains, but this seems like way too much for a "spill". Perhaps a coal bin was emptied on to the road bed at some time? The roadbed can be driven just a short distance before it becomes overgrown and impassable to vehicle travel. I made the mistake of not scouting ahead on one of the curves. It was a challenge to back up on the narrow grade to a turn around! I would suggest parking near the turn-off to the old cemetery. The "Find a Grave" website shows the names of 26 persons buried at the old Courtland Cemetery. Most are in unmarked graves. This is a very old cemetery with the majority of burials occurring before 1920. The double grave site in the left photo are of Tomas Allen and Jose Garcia who both died in 1918. I tried to walk on the old roadbed as much as possible. It was sometimes necessary to divert away a slight distance to avoid the thorny brush that has grown in the right of way. Particularly evil was the "White Thorn" bush pictured above. It appears that the construction of the southern spur was pretty straight forward. There was not a lot of excavation that had to be done to maintain the correct grade around the hillsides east of Courtland. The routing of the old road bed was generally pretty easy to follow. There were several instances in which small piles of coal were spotted along the way. I am guessing that these accumulations were spills off of the old trains. Away from the rocky hills, it was clear that a lot of dirt had been moved to bring the road bed up to the correct grade. A wooden culvert from the earliest days remains intact. The culvert is still open and appears to be functional. Not a lot of imported ballast was seen along any of the old road beds. There was one short run where it was seen west of the wye track leading into Courtland and a couple of instances around the trestles and that was about it. As was common, this ballast material was smelter slag. 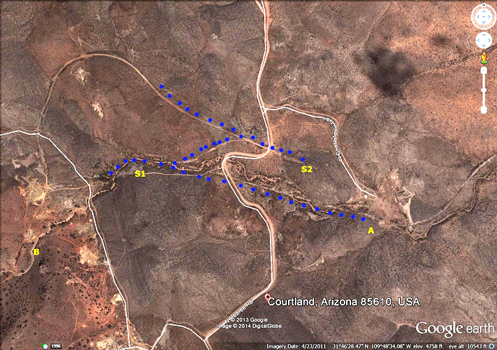 This photo is a Google Earth View of the Wye Track located east of Courtland. I have identified the points of the wye to associate the area with the photos below. The section of the wye track from W1 to W3 as it exists today can be seen in the photos above. As the bed turned toward W3, the cone shaped hills north of Courtland can be seen. The road bed continues into the distance to the left of those hills. A drainage cutting through the wye can be seen in the Google Earth photo above. The railroaders constructed trestles between W1 and W3 and between W2 and W3 to pass over the drainage in those two areas. The stumps of the supporting posts and the rocky abutment of one of the trestles can be seen above. The EP&SW company used round poles for their trestle supports, while the SP used square cut timbers. The photo on the left is the view that would have been seen as trains approached the wye from Kelton. This spot is identified as W2 in the GE image above. Trains would have turned to the left if headed toward lower Courtland or continued straight ahead if traveling toward upper Courtland. The photo on the right shows the view further into the W2-W3 leg of the Wye. The low hills in the distance are just east of Courtland. The old road grade bypassed those hills to the left before curving northward into lower Courtland. This is the view south from W2 looking down the main EP&SW line toward Kelton. In addition to the old wooden culvert and the remains of the two trestles, there were a few other relics from the railroad. There were several tie plates and spikes that were used to attach the rails to the wooden ties. I also spotted several old bolts and washers that would have been used to assemble the wooden parts of a trestle or bridge together. Here and there were several instances of lumber that appeared to be old railroad ties. I didn't see many household relics along the old wye. There were a few glass and ceramic shards. This junction does not seem to have been as inhabited as the wye track at Kelton. It took quite a bit more effort to accomplish the construction of the northern spur as compared to the southern branch line. As the roadbed turned to the west to enter the upper Courtland area serious excavation had to occur. It was reported that during the blasting of rock near the Mary Mine that heavy damage was done to the hoisting system of the mine. Once into Courtland, a double set of swtichbacks had to be constructed to gain the elevation necessary to reach the final set of mines. In the Google Earth view, there is nearly a 500' difference in elevation between A and B. 2 1/2 miles of track were laid to connect A to B that are only 1 mile apart in direct measurement. 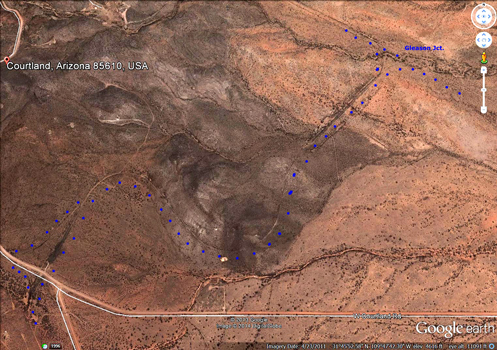 This photo shows the "ramp" of railbed between S1 and S2 in the Google Earth image. The photo to the left shows the back end of S2. Depending on the direction of travel, trains would have pulled into this space before the switch was thrown to proceed down to S1 or on up to the end of the line near point B on the Google Earth View. The right hand photo show the old roadbed west from S2 towards Point B. These foundations are on the rail line west of S2. I am not sure whether they are railroad related or mine related. The tall walls may have housed a boiler. These mine dumps are near the end of the northern spur line. The road was originally surveyed to continue on to the town of Gleeson, but the construction was never accomplished. Upper Courtland was known as the "tenderloin" district of the Courtland area. All sorts of entertainment was available there. It was apparently the only district in which it was legal to purchase alcohol. 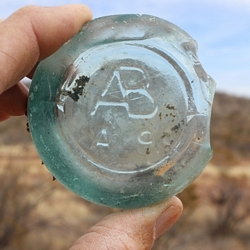 I saw these old beer bottle bases while walking around the area near the upper switchback on the northern spur. These photos show the SP roadbed at the Courtland Road crossing. There is a primitive road on the old SP bed. It runs several miles east to a crossing fence. 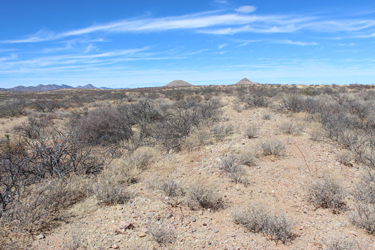 Maps show the area beyond the fence as Arizona State Trust Land. It is a hike from the fence to the Kelton wye. 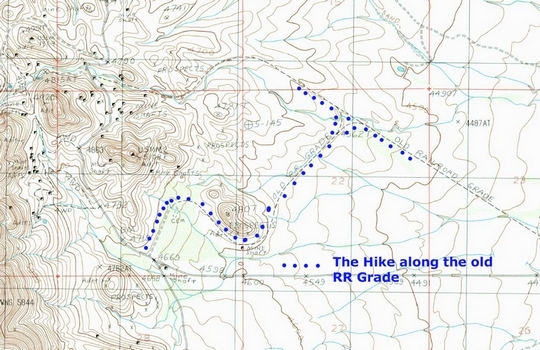 The SP roadbed is not elevated much above the surrounding terrain. The trestles would not have been very tall. The SP used square cut timbers in their trestle construction. 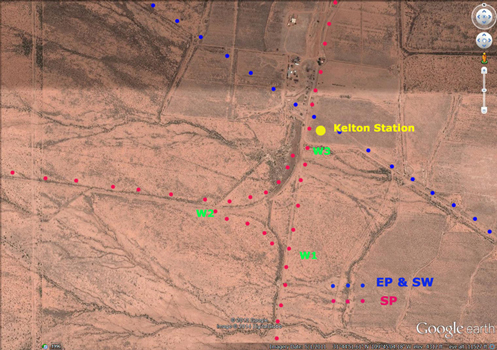 The Google Earth Image is of the location of the Kelton station which was located at the crossing of the EP&SW and Southern Pacific lines. Just south was the wye track that SP used to travel to Gleeson and the Holmes Station south of Courtland. There is a modern farming operation just north of the Kelton wye. Maps indicate that area north of the wye is on private land. I did not go north of the wye. This map from David Myrick's Railroads of Arizona Volume 1 shows the layout of the area around Kelton. These photos show the view from W2 on the Google Earth Image of the Kelton area. The photo on the left is looking eastward into the Kelton Wye. To the left would have been the turn towards Pearce. To the right was the turn toward Douglas. The photo on the right is looking back to the west along the road bed towards Courtland. These photos were taken looking into the Kelton Wye from the south (W1 on the GE image above). The left photo shows the leg of the wye towards W2 and on to Courtland/Gleeson. The road straight ahead through W3 led to the Kelton Station, the EP&SW crossing and then on to Pearce. The right hand photo shows the roadway south from W1 towards Douglas. Although many miles of track were installed in that direction, this section of road was never used. The tracks were removed in 1924. 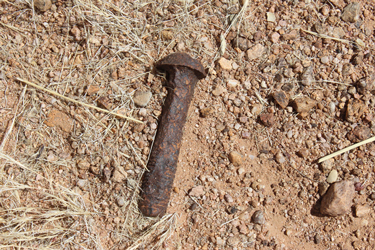 There were many very old looking railroad spikes seen around the wye track. There were almost as many of the curled pieces of iron. I wonder whether they were some kind of lock washer? The bolt in the right photo looks like a track bolt that would have been used to fasten two sections of rail together. 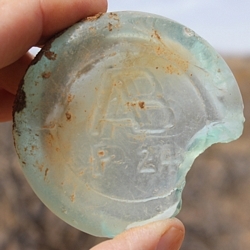 There were many pieces of broken glass and ceramics seen scattered around the Kelton wye. The area looked very much like a place that had once been inhabited. In the interior area of the wye track were several concrete floors and brick structures. My guess is that they were somehow associated with the section houses depicted in the Myrick Map of the area. There was one non-native tree growing along the wye. I could not identify it. This is a panoramic view northward across the interior of the Kelton wye. The line of dirt piled in the distance appears to be an attempt at erosion control. The dirt is piled on the 3rd leg of the wye track. The best source of information that I have found of the history of these old railroads is David Myrick's "Railroads of Arizona Vol.1 the southern roads". Online references to the old rail lines can be found here and here.